The president switched positions Wednesday, pledging to continue his administration's "zero tolerance" policy of prosecuting immigrants who cross into the country illegally while agreeing to stop the separation of children from their parents while they are detained and go through the legal process. "We are keeping families together, and this will solve that problem," he said after signing the order in the Oval Office. "At the time, we are keeping a very powerful border, and it continues to be a zero tolerance [policy]—we have zero tolerance for people that enter our country illegally." Trump quickly added that he "didn't like the sight or the feeling of families being separated." "It's a problem that's gone on for many years, too many administrations," he said, claiming that no one has had the "political courage" to deal with the issue he claimed has been a problem for more than 60 years. As Trump briefly outlined, the order does nothing to reverse the administration's policy of prosecuting all illegal border crossings, which critics have blamed for causing the separation of immigrant families. Instead, it calls on other federal agencies, along with the Department of Homeland Security, to provide facilities to house children with their parents or other family guardians as the parents go through the process of being prosecuted for illegally entering the United States. 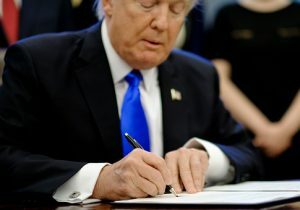 "The secretary of Homeland Security, shall, to the extent permitted by law and subject to the availability of appropriations, maintain custody of alien families during the pendency of any criminal improper entry or immigration proceeding involving their members," the executive order states. It allows for the DHS secretary discretion to separate children from their families only when leaving the children with the family members "would pose a risk to the child's welfare." The president's abrupt decision to change course and respond to the public outcry came after a growing number of Republicans in Congress and other GOP luminaries this week spoke out against the policy, deeming it unnecessarily cruel. Republican leaders on Capitol Hill spent the early part of the week working to craft a legislative fix that would end the family separations. As of Wednesday afternoon, more than half of Senate Republicans had signed onto a narrowly crafted measure aimed at keeping families together while ensuring that immigrants entering the country illegally continued to be prosecuted. The bill would provide 225 new immigration judges and prioritize the cases of children and families detained together in federal facilities. Texas Sens. John Cornyn, the No. 2 GOP Senate leader, and Ted Cruz worked quickly to forge their bills, along with the support from Sens. Thom Tillis (N.C.), Marco Rubio (Fla.), Lindsey Graham (N.C.), Tom Cotton (Ark. ), and Dean Heller (Nev.). "Treating these families with compassion by allowing them to remain together and enforcing the law on our books is not mutually exclusive," Cornyn said in a statement. "This legislation allows children to stay with their parents while they await their court proceedings in a separate, safe facility." Democratic leaders, led by Sen. Chuck Schumer (D., N.Y.), quickly said that Democrats would not support the legislative effort and put the onus on Trump to take immediate action and issue an executive order to put a stop to the family-separation policy. "The president alone can fix it with a flick of a pen by signing a presidential order to end the agonizing screams of small children who have been separated by their parents," Schumer said Tuesday. Other Republicans agreed that Trump could halt the practice on his own. Sen. Orrin Hatch (R., Utah), who is normally a Trump ally, on Tuesday gathered signatures from 11 other GOP senators backing a letter to Attorney General Jeff Sessions calling on him to end the family separations while Congress works to find a solution. The Republicans who signed the letter include: Sens. John McCain (Ariz.), Cory Gardner (Colo.), Susan Collins (Maine), Lisa Murkowski (Alaska), and Bob Corker (Tenn.). While the executive order, which the White House titled "Affording Congress an Opportunity to Address Family Separation," aims to quickly address the current controversy, Trump and administration officials continued to call on Congress to close loopholes they argue led to the family-separation issue, along with several other problems with U.S. immigration law. House Republicans had previously planned to take up two comprehensive immigration measures this week: a more conservative bill sponsored by Judiciary Chairman Bob Goodlatte (R., Va.) and a GOP-leadership-backed measure that combines a plan to shield so-called Dreamers from deportation with several of Trump’s top priorities, including funds to build a border wall, an end to the visa lottery, and limits on visas for extended family members of legal immigrants. It's unclear if they will include provisions to address the family-separation issue after Trump's executive action on it Wednesday. Gene Hamilton, who serves as counsel to Attorney General Jeff Sessions, told reporters late Wednesday afternoon that the executive action is "another example" of Trump stepping in and acting when Congress refuses to do so. "Our focus is getting Congress to provide permanent fixes to address these loopholes in existing law," Hamilton said. The Obama administration largely avoided the problem of separating children from their families by releasing them into the country and asking that they return for their immigration proceedings, which the families seldom did. The Trump administration blames the policy for encouraging more immigrants looking to illegal enter the United States to bring children along with them in order to benefit from the so-called "catch-and-release" policy. The Trump administration wants to be able to quickly prosecute illegal-immigrant parents so they can return them, as well as their children, back to their home countries. There is a massive backlog in the cases related to a dearth of immigration judges. The Trump administration has also pointed to a 20-year-old settlement agreement to a federal court decision as the reason it felt it could not keep children with their parents in immigration detention facilities. U.S. officials have repeatedly cited the decision, Flores v. Reno, or the "Flores settlement," as the reason behind its family-separation policy. The settlement requires the federal government to place children with a close relative or family friend "without unnecessary delay," rather than keeping them in custody. More to the point, it directs the federal government to keep immigrant children who are in custody in the "least restrictive conditions" possible. Several Republicans have written legislation that would overrule Flores and allow children to remain with their parents while the parents go through criminal prosecution and deportation proceedings. Many immigrant families try to circumvent the prosecution process by claiming asylum from dangerous, often criminal conditions in their home countries, stretching the process out for months or years. In lieu of congressional action, Trump’s executive order requires Attorney General Jeff Sessions to file a request with the U.S. District Court for the Central District of California to modify the Flores settlement agreement to allow federal authorities to detain immigrant families together throughout the prosecution and deportation process. Right now, DHS has the authority to detain a family unit together for 20 days. "What we’re asking from [the judge] is a modification of that to go beyond 20 days," Hamilton said, noting that most cases take far longer than 20 days to adjudicate and move through the court system. "It’s critically important that [the judge] act and allow these cases to continue to be adjudicated while these families are allowed to stay together," he said.